The PlayStation 4 is almost upon us, but that doesn’t mean support for the ageing PlayStation 3 is going to end anytime soon. An app for Verizon’s Redbox Instant service is landing in the PlayStation Store today, giving movie buffs another means of streaming an unlimited number of films in the US. Redbox Instant has been available on the Xbox 360 since March, so a corresponding app for the PlayStation 3 is long overdue. To make amends, the company is introducing an exclusive feature called ‘The Playlist’ for owners of Sony’s video game console. It’s a small discovery feature that highlights movies based on curated themes such as ‘Beards on Film’ and ‘Stuff Blowing Up’. Redbox Instant became available on Google TV and Roku hardware over the summer, after passing more than 1 million film and video game disc rentals in Canada. If you’re interested in renting a DVD or Blu-ray – new releases often become available as physical discs first – the new PlayStation 3 app will also let you find and reserve titles at more than 43,000 Redbox kiosks. 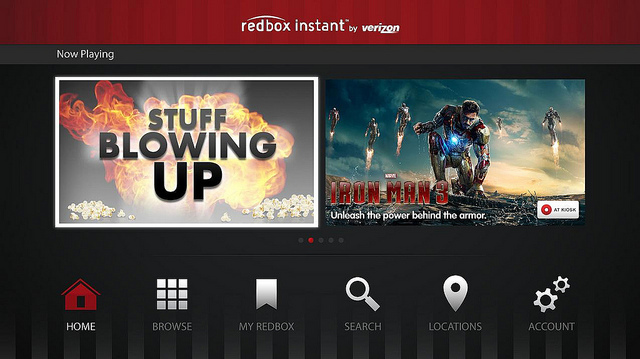 To compete with the likes of Netflix and Amazon Instant Video, Verizon needs to ensure that Redbox Instant is available on every hardware platform known to man. A PlayStation 3 app is notable, but we’re interested to see if the service ever expands internationally, or at least differentiates itself in a meaningful way.